How is the commit percent decided for Area 51? I know it is based on rep, but how exactly does it work? With that caveat, the formula we use right now works like this: We give each user a "score" based on how likely we think they are to contribute to the site. It's a bit kludgey right now because we don't have a whole lot of data. The one piece of data we have that tells us a lot and is hard to game is a user's reputation on the existing sites. where SUM is over each site a user has an account on, and DAYS is the amount of days since they first committed to the proposal, or visited the proposal after committing. The way to read this is that we consider a user with 10000 reputation to be almost twice as likely to contribute as a user with no reputation, and a user who doesn't revisit the proposal in a year is 19% less likely to contribute than if they revisited. Note that you cannot see your own commitment score (but you can calculate it on your own), neither can you see the exact value of the total commitment score (you can only see the percentage, which is divided by 5 and rounded down). We've tweaked the formula a few times since this was originally posted, based on the data from the first site betas. I've corrected the formula above to be the very latest. In general, we've tweaked the value of high-rep users downwards since they don't seem to be that much more likely to contribute, and given brand new users a bit of a boost as well. We've added a decay factor to commitment votes on Area 51. This applies only to the Commitment Score portion. Basically, the older a vote is, the more it decays. This is very gradual: something like 10% over 6 months. If a user is very committed, they can "renew" their vote by visiting the proposal while logged in. It's not (just) the total reps. The Apocalyptic Defense site has total rep of 354,402 but only 11% commitment percent. Probably the percentage is a mixture of people count (41 for Gaming, 26 for Apocalyptic Defense) and total rep.
Hmm the ranges do not intersect. But it seems 2,000 is the answer. The WordPress Answers proposal is one exception. A lot of people came over from the wp-hackers list on WordPress.org when I announced it, and as such, only have 51 rep. The comments show great activity potential, but the rep shows almost none. This is, of course, the ultimate goal, to bring in outsiders. Same here for the GIS website. This kinda dissapoints me, but I'm sure the GIS website will be created at some point. Or not? Almost all users who followed it, already commited, so I'm not sure if this will grow higher. The following Python 3.x script can be used to compute the commitment percent based on the new formula. The scores of the 3 criterion will be emitted in the end, showing what kind of users is needed to improve the percentage. From a few proposals I have tested on, it turns out the strictest criteria is "100 committers with at least 200 rep on a single site". The numbers of that criteria may be inflated because of Is reputation from Area 51 counted towards the commitment score?. 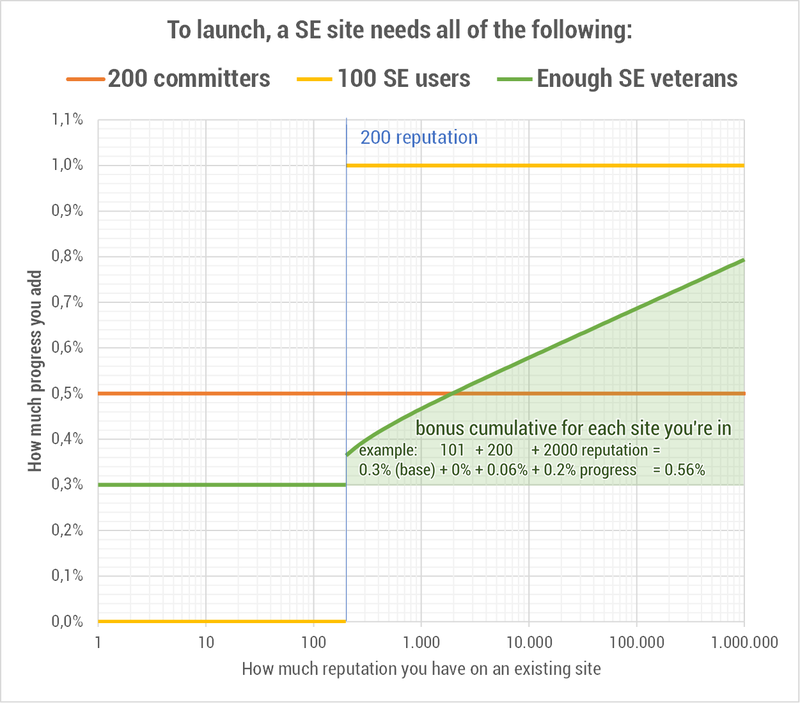 Why do some sites require more commitments than others to launch? How many commits are needed to go beta? How often is the Area 51 commit percent re-calculated?